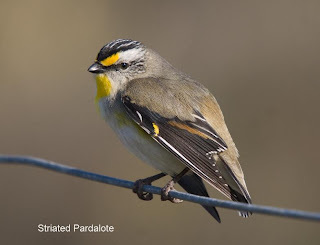 Birds in Tasmania: Striated Pardalote--"orange-tipped"
Yes, I have to plead guilty in all too often not giving all the information that I should! The spot is at the entrance to the Cape Deslacs conservation area, along Bicheno St., (backs on to Clifton Beach). The area is part of the remnants of a saltmarsh, which is now flooded presumably by rain water as Black-fronteds are usually found near fresh water. Failing finding them there, you might try Rushy Lagoon (near Lauderdale)--turn off at the large radio aerial, past Clear Lagoon (on the left), next right and follow the road to the farm house. 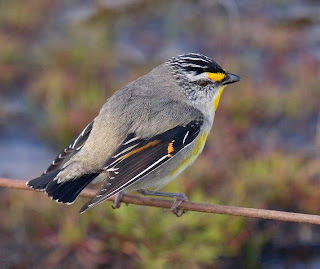 Recently there have been several birds feeding on the lagoon margins--very cryptic birds, so be warned. I should have also mentioned that the presence of 'orange-tipped' birds would suggest that they're Mainland birds that joined the migration South. My knowledge of the distribution of the different 'coloured' striateds is minimal, so I have no idea where they are usually found. Thanks for that info Alan, you are a font of knowledge to the inexperienced birdwatcher such as myself. Hello, I may not always leave a comment (I never know what to say!) but I just wanted you to know, I enjoy your blog enormously and always visit to see what you've spotted.